Therese Belivet (Mara Rooney, THE GIRL WITH THE DRAGON TATTOO) is a young woman who dreams of becoming a professional photographer. For now, though, she works in the toy department of a Manhattan department store. When glamorous socialite Carol Aird (Cate Blanchett, BLUE JASMINE) stops in to look for a Christmas gift for her young daughter, the two women strike up a conversation. There is an immediate connection between them but it’s all businesslike. Carol inadvertently (or not) leaves her kid leather gloves behind and Therese tracks Carol down to return them to her. Carol is so relieved, she invites the young woman over to her home in leafy New Jersey to thank her but there’s more to her invitation than simple appreciation. Carol, who is going through a divorce and custody battle with husband Harge (Kyle Chandler, THE SPECTACULAR NOW), is attracted to women. She’s already been in one lesbian relationship — with Abby (Sarah Paulson, MUD) — but that was before she married Harge. Nevertheless, Harge is more than a bit suspicious when he meets Therese. He knows what his estranged wife wants. For Therese, she doesn’t know what she wants. She is clearly attracted to Carol but is there more to it than that? Her boyfriend, Richard (Jack Lacey, TV’s THE OFFICE [US Version]), thinks it’s just an infatuation and believes that Therese will come back to him when Carol gets bored. With her daughter with Harge for Christmas, Carol decides to get away from the city for a few days to clear her head. She invites Therese on a road trip out west and Therese agrees to go hoping it will give her a chance to understand her own feelings. But as America welcomes in 1953 and a new president, neither it nor Harge is ready to accept Carol and Therese’s forbidden romance. CAROL is adapted from the novel, “The Price of Salt”, by Patricia Highsmith, which was first published in 1952 under the pseudonym Claire Morgan due to its risqué subject matter. (Highsmith also wrote “Strangers On a Train”, which was made into a film by Alfred Hitchcock, and “The Talented Mr. Ripley”.) 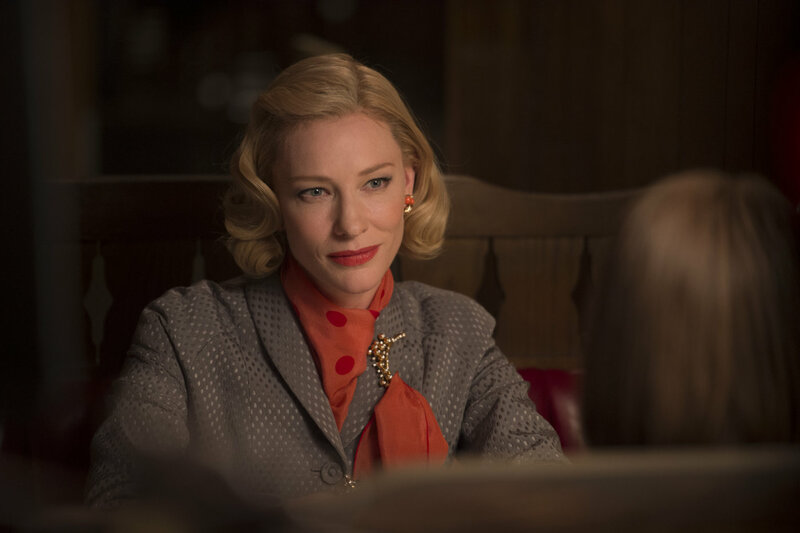 If CAROL had been made in the 1950s, the world would have been blown away by its audacity to tackle the subject of lesbian romance. But it was made in 2015, the same year that gave us transgendered characters on film, TV and reality. Even the groundbreaking BROKEBACK MOUNTAIN came out in 2005. Lesbians are old news already, which is why this film left me decidedly underwhelmed. On a positive note, I thought that both actresses were superb, though I couldn’t quite figure out how Carol always looked like she had just stepped out of a Park Avenue salon. The set designer, too, did a fantastic job transporting us back to 1952. (I’m always amazed that Hollywood can find so many vintage cars that are still in working condition.) But when I left the cinema, the sum of my thoughts pointed to three questions: Is this story relevant to today? Does it need to be? And the big one: Is Carol a predator? I think she is. Film critic Richard Roeper mused on who would star in this film had it been made back in the day. I had the same idea. In his casting, Carol would be played by Bette Davis, Therese would be Audrey Hepburn and Harge would be James Stewart. In mine, it would be Rosalind Russell, Natalie Wood (though Hepburn would be an excellent choice too) and Fred MacMurray. Let me know who your casting choices would be!